In October 1846, a powerful hurricane bore down on Key West, damaging or destroying nearly all of the homes in the city. In the aftermath of this devastating storm, Captain John Huling Geiger, a harbor pilot and master wrecker, began construction on a grand home that would serve as his family’s residence. Today, that home is known as the Audubon House. The construction of the Audubon House occurred between the years 1846 and 1849. At the time, Captain Geiger was one of Key West’s wealthiest men, and he wanted a home befitting of his family’s stature in the community. He chose a prominent location for the home on the corner of Whitehead and Greene Street so it could be seen and admired by all coming and going from the waterfront. Captain Geiger used the best carpenters and finest materials available for his mansion, which was built in the American Classic Revival architectural style. A model of quality workmanship, the entire wooden structure was constructed with mortise and tenon joints. The wooden frame of the House and the floors are of Dade County Pine, a now-extinct hardwood almost impervious to termites. The exterior doors are cypress, and the staircase is mahogany. At the time of the home’s construction, the Custom House had not yet been built across the street, and there were no other structures between the home and the ocean to obstruct the view. A cupola at the top of the house (which no longer remains) gave Captain Geiger an unobstructed view of the sea, an important feature for a wrecker’s home. Four generations of the Geiger family lived in the house for nearly 110 years. The last of Captain Geiger’s descendents to call the house his home was his great-grandson, Captain William Bradford Smith. Captain Smith was a recluse who lived alone in the house for over 20 years without electricity, running water, or an indoor kitchen. At the time of his death in 1956, the home had fallen into disrepair, with the windows shuttered and nailed closed. In 1958, the house was slated for demolition to make way for a gas station when Mitchell Wolfson and his wife Frances stepped in to save it. 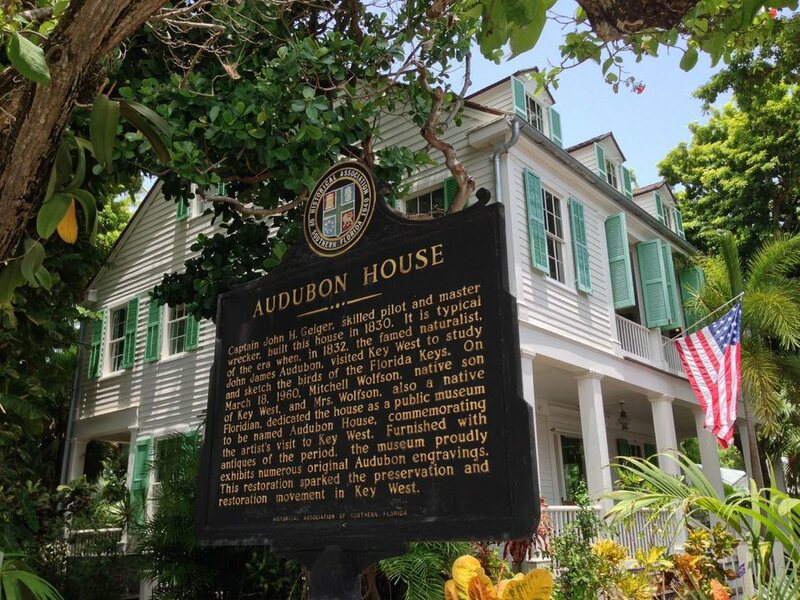 Their purchase and subsequent renovation of Audubon House sparked the restoration movement in Key West that is evident today in the city’s Historic Old Towne District. The Wolfson family first came to Key West in the 1870s and owned a goods store on Duval Street. Although the family had relocated to Miami in the 1920s, they maintained close ties in Key West. Jessie Porter, a local citizen and family friend, alerted Mitchell and Frances Wolfson to the impending destruction of the Geiger home. Influenced by local folklore surrounding John James Audubon’s connection to the home, the Wolfsons decided to purchase and restore it for use as a historic museum. After a two-year restoration, during which time electricity was added to the home, Audubon House Museum opened in 1960. The Museum commemorates Audubon’s 1832 visit to Key West and shares his artwork within the Geiger home. The home is furnished with antiques dating to the first half of the 19th century, including several items originally belonging to the Geiger family. Those can be found on the third floor and in the parlor (painting of Captain Geiger) and dining room (serving table). A replica cook house in the gardens provides further insight into life in mid-19th century Key West. The Wolfson family continues to care for the property through the Mitchell Wolfson Family Foundation, a non-profit educational organization.